The Cambrian Mountains Wool Challenge — Ollanua - Handwoven Woollen Goods, Irish Craft, Homewares and Gifts, Handwoven Textiles, Northern Ireland. We're delighted to be taking part in a touring exhibition showing how Welsh wool from the Cambrian Mountains can be used to make beautiful and practical products - The Cambrian Mountains Wool Challenge. The Challenge was formed by the Cambrian Mountains Wool Initiative and offered designers the chance to use Cambrian Mountains wool fleece, yarn or woven fabric to produce their creation. I decided to dye half of my Cambrian yarn with natural indigo and use it to create a rug version of our Newgrange design. It was a chance to try something new, being the first time I had dyed with indigo and woven a rug! Handweaving by itself is a slow process but dyeing the yarn before weaving adds a whole other challenge. First, the yarn has to be wound from the cones it comes on from the spinning factory, into 'hanks' - loose manageable wraps of yarn which allow the dye to penetrate. It then has to be gently washed to remove any excess oils or factory finishes that might stop the dye from taking evenly. Indigo is a bit of a magical dye to work with because it has to be used in it's 'reduced' state - with all oxygen removed from the dye bath. This turns the solution a yellow-green colour, as indigo only shows its characteristic vivid blue shades when it combines with oxygen. The yarn is dipped just for a minute or two into the bath, and slowly turns from yellow-green to blue when removed and exposed to the air. I built up the colour with different numbers of dips to produce three varying shades of blue. Sounds confusing? I found lots of helpful information on Jenny Dean's website and books and from my indigo supplier, www.georgeweil.com. After dyeing, it was time to start weaving. 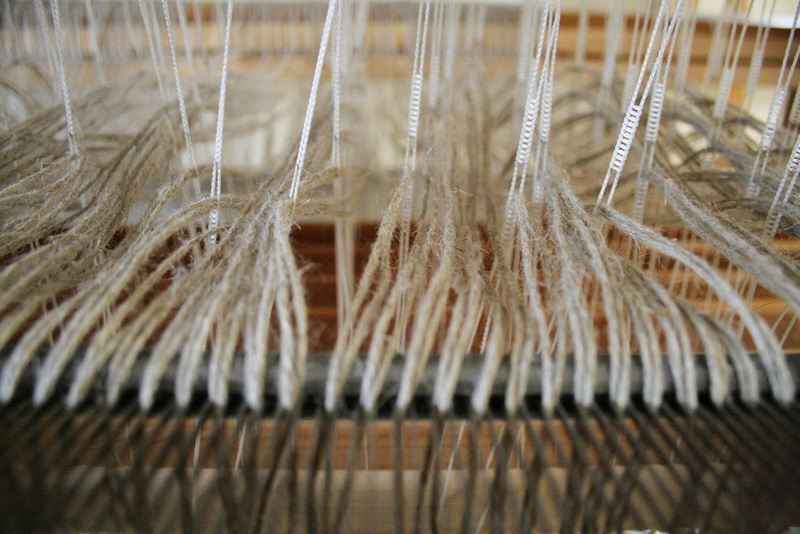 I used a warp of strong linen cord, spaced out in the reed of the loom to allow the Cambrian wool weft to pack down and cover it completely (this is called a weft-faced weave). The yarn was 'bubbled' during weaving (shown in the last picture above) to prevent the rug from narrowing in. Finally, after weaving and cutting from the loom the linen warp ends were knotted and threaded back into the weft to make a neat top and bottom edge. I'll be heading to London to have a look when the Cambrian Mountains Wool Challenge exhibition tours to the London Welsh Centre, on the 19th and 20th September 2015, which also happens to be the start of London Design Festival... looking forward to meeting the other challenge designers and a peek at a few LDF events!